Miami FL – February 4th 2017 – Unicorn Children’s Foundation is pleased to announce that our 2nd Annual Luncheon was a smash hit! 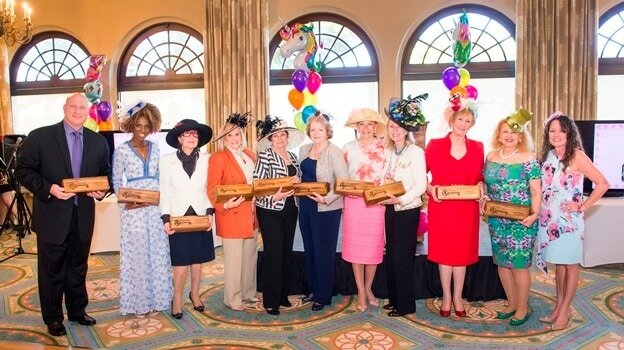 This year’s Mad Hatter’s theme, hosted by the amazing Gwen Taylor, incorporated all the elements of Alice in Wonderland, as we honored longtime benefactor Madeline Hillsberg. Overall, Unicorn collected over $75,000 in honor of Madeline, to help kids with special needs excel in the community! Upon arriving at the beautiful & exclusive Indian Creek Country Club in Miami Beach, guests were immediately taken with the enchanting décor – fragile tea cups stacked precariously high with balloons and teapots, all to compliment the theme with a little organized madness. This trend continued with amazing table decorations, all courtesy of Floral Designs by Yamir, Inc. The madness continued with an assortment of auction items, which included a simply stunning emerald golden necklace up for grabs to the lucky live auction winner. This, along with some unique art pieces specifically made for the event, courtesy of Connie Danluck, made for a very special shopping experience for all guests. Emceed by the sensational Spottswood Dudley, whose top hat had no equal, the program included musical entertainment by Pianist Rick Leonard and singer Lisa Donald-Minus, as well as a special appearance by Envee. It culminated with a beautiful honoring of Mrs. Madeline Hillsberg, who has supported Unicorn for over 2 decades. In addition, guests participated in a chance drawing, the lucky winner of which won a 14K gold diamond necklace, courtesy of Gregory’s Fine Jewelry. There was even a magnificent hat contest, the winner of which took home a custom set of tea cups/teapot, as well as a signed original book of Alice’s Adventures in Wonderland by Lewis Carroll. This program was only complimented by the amazing food, drink, and service provided by the Indian Creek Country Club, as guests enjoyed a delectable menu specifically crafted for this event. Unicorn would like to thank all of our Sponsors for helping make this event a resounding success, including; Simply the Best magazine, Gregory’s Fine Jewelry, Floral Designs by Yamir, and Mrs. Connie Russell. Finally, a big THANK YOU to the cross-section of community leaders, business professionals, philanthropists, and attendees from the tri-county South Florida area who participated in and supported this event. We could not do what we do without your support. Don’t miss our upcoming Gala – The Unicorn Ball, which will feature an encore performance by the one and only renowned speed artist Michael Israel, on March 11th 2017 at the Boca West Country Club. Tickets and more information available at UnicornChildrensFoundation.org.